Researchers at the Ecosystems Center helped pioneer the use of stable isotopes to study ecosystem dynamics. Some elements that occur in nature, such as carbon, nitrogen, and sulfur, have stable isotopes. All elements have an average atomic weight that is based on the number of protons plus neutrons in their nucleus. Stable isotopes of an element have a slightly higher or lower than average weight due to having more or less neutrons. This affects how the isotope interacts with its environment and allows scientists to measure the abundance of isotopes in a sample. Scientists are most interested in the stable isotope ratio of a sample from an organism or the environment. The stable isotope ratio is a calculation that gives the relative proportion of isotopes within a sample. Biochemical and ecological processes create different stable isotope ratios in different biological materials. For example, organisms higher in the food chain typically have higher ratios of nitrogen isotopes than organisms lower in the food chain. Stable isotopes are a way to measure ecosystem processes without disturbing them. Researchers can study the natural abundance of carbon, nitrogen, and sulfur stable isotopes by taking a sample at a site. Researchers can also add small amounts of isotope-enriched material to an ecosystem, in what is called a tracer study. In tracer studies, scientists track the fate of a particular element throughout an ecosystem. In both natural abundance and tracer studies, researchers study the isotope ratios at different locations and over time in an ecosystem. Typically, samples collected in the environment are processed in the lab using analytic techniques such as mass spectroscopy. Stable isotope ratios give insight on the process of how elements move through an ecosystem. For example, scientists can study how excess fertilizer affects an ecosystem at different steps in time and in the food web, rather than just observing the end result. They include stable isotopes of an element, usually nitrogen, in the fertilizer, add it to the ecosystem, and then test different parts of the ecosystem for higher or lower ratios of isotopes. This tells scientists where the excess fertilizer ended up. In 1985 researchers at the Ecosystems Center received a grant from the A. W. Mellon Foundation and the US National Science Foundation to start a stable isotope research program. The researchers bought an isotope ratio mass spectrometer, which allowed them to estimate stable isotope ratios from samples, and hired Brian Fry to help with the project. Fry and Bruce Peterson headed the new Stable Isotope Laboratory at the Ecosystems Center. 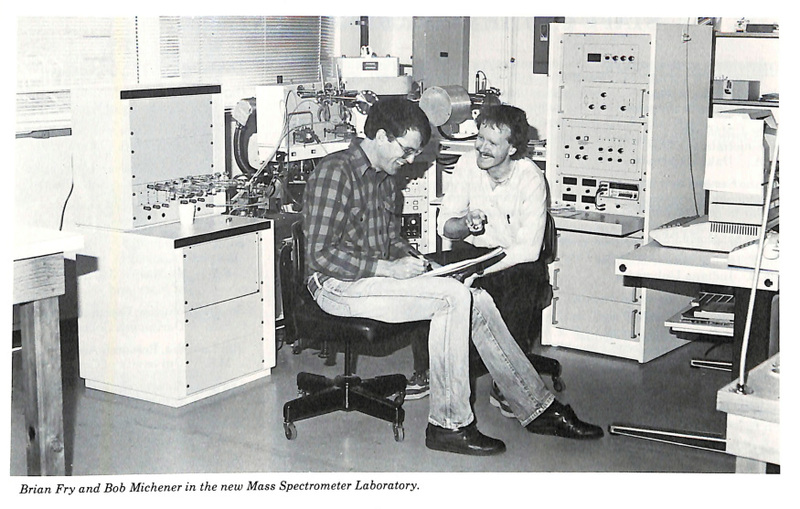 Before the mid-1980s, most ecologists did not have training in analytical chemistry and most ecology labs did not own mass spectrometers. The Ecosystems Center’s Stable Isotope Laboratory aimed from its beginning to train other ecologists how to use stable isotopes in their research. Peterson and Fry held several workshops in Woods Hole, MA, for this purpose, including a workshop in 1989 to train researchers from the Long Term Ecological Research network. One of the first stable isotope studies at the Ecosystems Center in the early 1980s looked at natural abundance and isotope tracers in marsh ecosystems. The purpose of this study was to quantify the flow of carbon, nitrogen, and sulfur in the Great Sippewissett salt marsh in Massachusetts. The researchers found that stable isotopes of sulfur were useful to study food webs in aquatic systems. 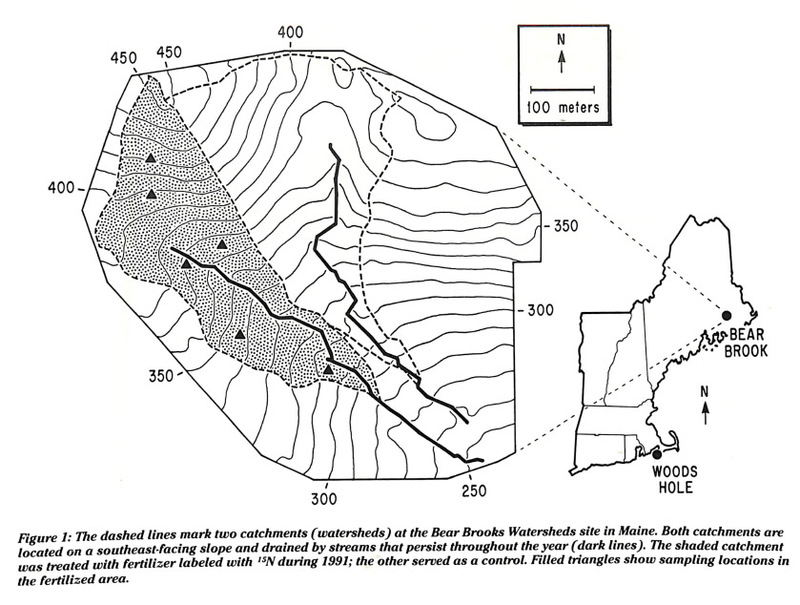 In 1986 Ecosystems Center researchers started two more stable isotope studies in the Georges Bank fishery in New England and in Kuparuk River in Alaska. Researchers aimed to study the flow of energy in food webs in these ecosystems. Although early stable isotope studies focused on aquatic ecosystems, researchers used stable isotopes to study terrestrial systems as well. Scientists from the Ecosystems Center worked with colleagues at the University of New Hampshire to add stable isotope-enriched nitrogen fertilizer to a forest in Maine starting in 1991. Studying the flow of the nitrogen isotopes through the ecosystem, the scientists traced how different parts of the forest used fertilizer. After one year of experiments, they found that the most of the nitrogen ended up in the forest’s soil.